Three new works by Kohei Nawa continue his exploration of skin, surfaces and borders. The first time I saw Kohei Nawa’s work was in Barcelona, as part of an exhibition of five modern Japanese artists entitled “Kawaii!” Fittingly, his work there was rather cute; a collection of animals and toys distorted by glass balls that enveloped them like glitzy frog-spawn. Curiously eerie and surreal, they seemed a little like the product of an imaginative child let loose with a glue gun and a bowl of marbles in a toy shop. 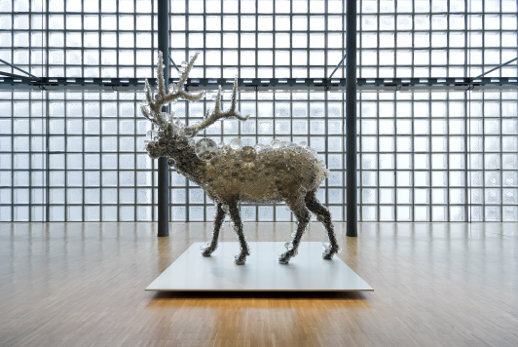 The stand-out piece, however, was a little more adult: a majestic deer, elegantly frozen in the middle of the room, as if startled by headlights and pelted with hailstones made of crystal. It was literally mesmerizing. Stepping into Nawa’s current exhibition, I was greeted by another deer, looking like the love-child of Bambi and Swarovski. Yet this time, its larger scale and the surroundings helped it to transcend the merely cute to approach something epic. It is hard to imagine a more appropriate setting than Maison Hermès in Ginza, with its walls of square white tiles acting as a geometrical counterpart to the work. Each opaque block was stunningly refracted in the deer’s coat of glistening baubles. Nawa’s work is concerned with skin, surfaces, borders; here the “beads,” as he calls them, are not merely a decorative pelt or just a mirror for the surroundings, but a charged membrane between the external and internal. From certain angles, the slicked-down hair and fossilized hooves are magnified, as if through a fish-eye lens; but turn your head and convex images of the glass tiles begin to undulate inside the spheres. The juxtaposition of these dynamic reflections and the deer’s icy, static pose creates an unnerving sense of life within the animal’s body. 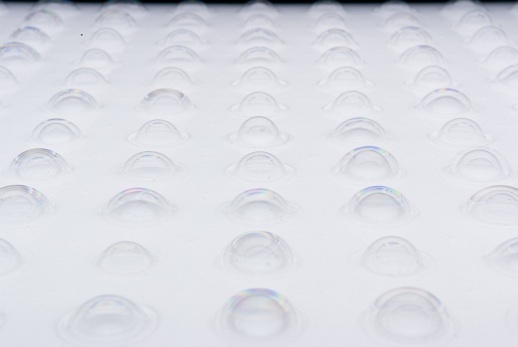 Its artificial membrane allows it to respond and answer to its environment, albeit only through rays of light. It is hard not to be reminded of Damien Hirst’s famous formaldehyde shark; he also tried to confront viewers with their own mortality by displaying carcasses in modern surroundings. But whereas he continued to flog that dead horse – or rather lethal sea creature – for years, with endless rows of dissected sheep, Nawa has progressed beyond his earlier works to produce something altogether more unsettling. The title of the exhibition, “L_B_S,” stands for “liquid, beads, scum,” which respectively form the theme of each of the three pieces on show. 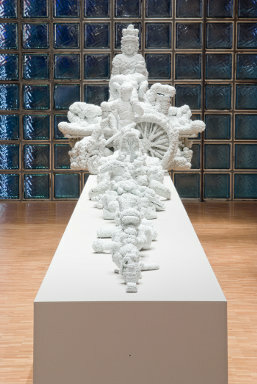 Just behind the beaded deer lies the “scum” sculpture, constructed out of a series of incongruous objects and statues. They are all covered in what looks like crumbling bread mold in a humid August (very seasonally appropriate). Their eerie, decaying surface invoked an inward sense of disgust that had me scuttle towards the back room after a few moments. Yet the “liquid” piece there did little to quell my squeamishness. At first glance, the two tanks of shimmering, luminescent white liquid was oddly hypnotising, with a grid of uniform bubbles silently erupting. But after a minute or two, it unnervingly began to resemble eyeballs slowly emerging out of a primeval swamp – albeit one made out of pearly nail varnish. It completed a triad of works that capture the strange rhythm of nature; its slow throb of multiplication, decay, regeneration, symmetry, disorder. Despite being finished in slick materials and dressed almost entirely in white, his works recall slow-motion nature videos where malignant cells split and spread, flowers splay and snap shut their petals, bees groove with a strange rhythm and liquids begin their osmotic slide. He carries off this representation of nature so accurately that for once, reading the blurb accompanying the exhibition is unnecessary. One understands intuitively that he is concerned with membranes, cells, skin; organic processes expressed through artificial means. And although all three pieces have an appreciable aesthetic beauty that is often absent in modern art, they also induce a skin-crawling queasiness through their laboratory-like precision and expression of decay and rebirth.